It's safe to say that if each of a player's first three head-to-head meetings against five-time US Open champion Roger Federer went to a deciding-set tiebreak, they probably have plenty of game. But when a reporter asked Nick Kyrgios after a four-set victory against Pierre-Hugues Herbert what the Australian believes his strengths are, the 23-year-old delivered a bit of self-deprecation rather than a serious self-analysis. SEE ALSO: Nick Kyrgios roared back from a slow start to defeat Frenchman Pierre-Hugues Herbert, 4-6, 7-6, 6-3, 6-0, and advance to a highly anticipated 3rd-round match against Roger Federer..
"My unbelievable movement, my returns, and my mental strength. Slice," Kyrgios said, joking. Those are not exactly the 23-year-old's greatest strengths. Kyrgios thrills crowds with his sizzling hot shots, blasting forehands and pulling off highlight-reel tweeners. "[I'm] just trying to play aggressive and just play my style of tennis," Kyrgios said of his mindset. Experts believe that said aggression and 'style' of tennis can certainly test Federer in the third round at Flushing Meadows, where the pair will clash in a first-week blockbuster. And it’s that unpredictability that might just be able to limit the legend’s rhythm. Federer thrives on dictating play from the baseline and moving opponents around with his forehand. But Kyrgios can take him out of that comfort-zone of sorts with his tremendous shotmaking ability. Former World No. 2 and 1996 US Open quarterfinalist Alex Corretja, who is commentating for Eurosport, believes Federer has had an ‘uncomfortable’ draw, competing against left-handed Yoshihito Nishioka of Japan and the enigmatic Frenchman Benoit Paire, who have not given him the best rhythm heading into this clash. "He can overcome any situation, because he's got magic on his hands. So he can definitely find a rhythm, even if the matches probably aren’t as good as he wished to get that feeling," Corretja said. "But of course, he needs to adjust and you need to adjust to different players and that's what it is in this tournament... now he's got a good test against a player who he usually has very strong matches and tough ones." But Corretja says that Kyrgios does have a major weapon that he can use to affect Federer: his serve. The Aussie hit a total of 59 aces in their three previous meetings. "Kyrgios has one of the strongest serves on the tour," Corretja said. "His serve [motion] is very easy, very loose so he can serve and keep on serving. The difference here is the fact that they play best of five, he needs to keep that for such a long time, which is not that easy." And maintaining that service performance for hours on end against Federer's pressure won't be a wlak in the park. But if Kyrgios is able to serve well throughout, what will make it so difficult to counter? "You can’t pick his serve, because he hits the ball so quickly out of his ball toss,” Drysdale said. “It’s very difficult to pick his serve. Even if you can, he at times hits it so hard that there’s nothing you can do about it." All of those tools should make for a captivating match, and give Kyrgios the ability to hang in there with the World No. 2 in Arthur Ashe Stadium. While both Corretja and Drysdale feel that Federer will be a bit too solid across a best-of-five set match given his plethora of experience, they agree that Kyrgios has the weapons to trouble the 98-time tour-level champion. "I don’t think there’s any question whether it’s going to be a tight one. It’s never over until it’s over with Kyrgios. The last two matches he played, I didn’t think he was going to win either one of them after the first set, because I didn’t think his heart was in it, and then suddenly things turned around,” Drysdale said. “It’s going to be very compelling stuff." Roger Federer in action against Benoit Paire at the 2018 US Open. 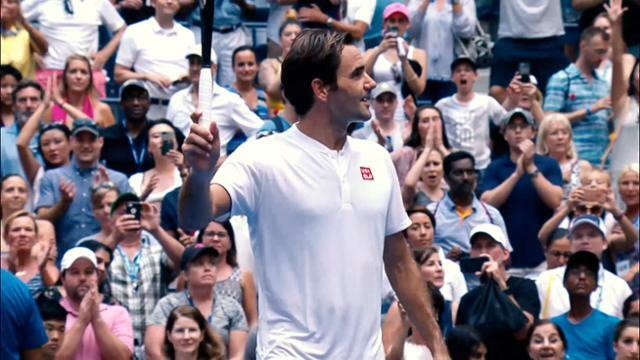 Roger Federer in action against Yoshihito Nishioka during the 2018 US Open. Roger Federer walks out on court prior to his match against Benoit Paire at the 2018 US Open. Roger Federer signs autographs during media day at the 2018 US Open. Roger Federer in action during practice at the 2018 US Open. Roger Federer speaks to the press during media day at the 2018 US Open. Roger Federer prepares to enter Arthur Ashe Stadium during the 2018 US Open. Roger Federer signs autographs after his match agains Benoit Paire at the 2018 US Open.